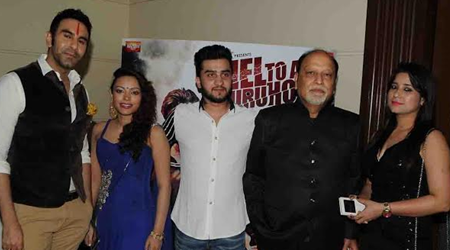 After releasing the film's poster which featured Ruslaan Mumtaaz, Devshi Khanduri and Rohit Pathak, the makers released the film’s first official trailer at an event held in Suburb Mumbai. Bollywood renowned choreographer Sandip Soparrkar was the chief guest and he unveils the first trailer of the movie. The intense trailer follows the turn of events and the gripping story will surely leave you speechless. Performances of Ruslaan Mumtaaz, Devshi Khanduri and Rohit Pathak in the film's trailer are commendable. Directed by Kunal V Singh and Produced by Mahesh Narula under the banner of GMD Films, the film is narrated through the perspective of Bank Robbery. The actors, who are known for their phenomenal acting skills and extremes of dedication, can be seen fighting for their loved one. Ruslaan Mumtaaz plays the role of Bank Robber in the Film. The Film's story revolves around a bank robbery and fight for love. Others present at the event were Abhinav Kashyap, Gopi Bhalla, Sushil Parasar, Rajesh Puri, Anil Dhavan, Alekh Sangal, Prithvi Zutshi, and Singer Shailendra Singh.